In yesterday’s 1st Round the morning wave benefited from calmer conditions, with the earliest off gaining around 2.5 strokes on the latest tee times. Notably, 15 of the 18 to break 70 were in the morning wave. Unfortunately for that afternoon wave, the morning on Friday was the harder half of the draw. Winds passed 15 mph, calming to around 5 mph by the afternoon, meaning early morning players played in conditions around 3 strokes more difficult than the latest afternoon tee times. Each hour on Friday was worth around 0.3 strokes the earlier your tee time was. Cumulatively between Thursday and Friday, the golfers with the easiest course played in conditions 3.1 strokes easy than the hardest conditions. However there was little difference within waves. Everyone teeing off on Thursday from 11:26 AM local time onward lost between 1.3 and 1.6 strokes to average and everyone teeing off before that gained 1.3 to 1.6 strokes to average. Only four of 23 players within 10 shots of the lead went off in the late Thursday/early Friday wave. That includes only one player (George Coetzee) in the top ten. 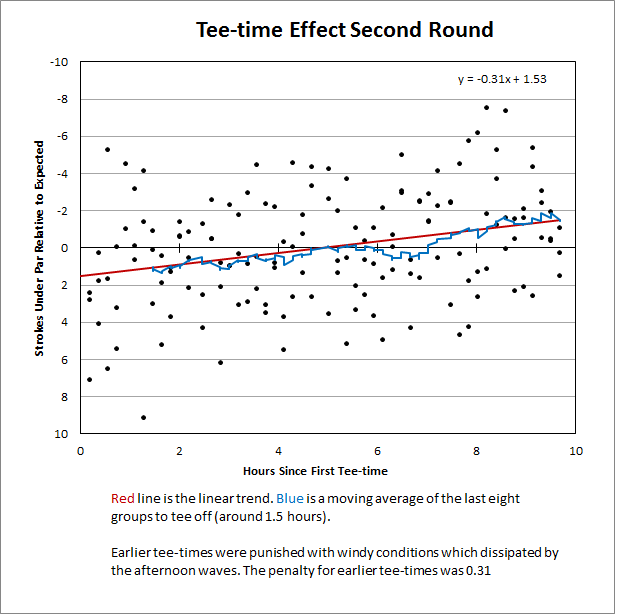 The R&A has decided to send golfers off two tees Saturday morning, reducing the expected difference between the earliest tee times and latest tee times to less than a quarter of a stroke (provided the weather remains similar to what we’ve seen thus far). That’s great for fairness, though forecasted wind is less than 5mph for all hours of play tomorrow. I thought your statement that only one player finished in the top ten thru Fridays round that played in the Thurs late Friday early window quite compelling. Unlike golf, most other sports – albeit team sports – play in the exact same time frame. When tee times are as far apart as five hours, ran iand windy conditions can occur quickly. What are your thoughts on Spieth? He’s in the top 10 in the world and he’s only 20 years old, but he’s not the longest hitter or best ball striker. A quick glance at the stats seems to suggest he makes up ground on the field with his putting and scrambling ability. From what I understand, that isn’t as sustainable or advantageous as ball striking ability. Yeah he’s been equally as good this season vs, last, but it definitely looks like he’s doing it with better putting/short play this year. I’m not too worried he’s doing much that’s unsustainable though. How did you adjust for golfer’s strength? Nine of my top 10 pre-tourney started early on Thursday so had it been perfect conditions all day, I still think they would have outperformed the latter group. Based on my own performance rankings pre-tournament. 7 of the top 10 were in the morning Thu wave, but overall the two waves were equal in expected performance. Cool, thanks. I knew you had an “expected performance” but wasn’t sure where that number was coming from. Crazy that the tee times made such a big difference.